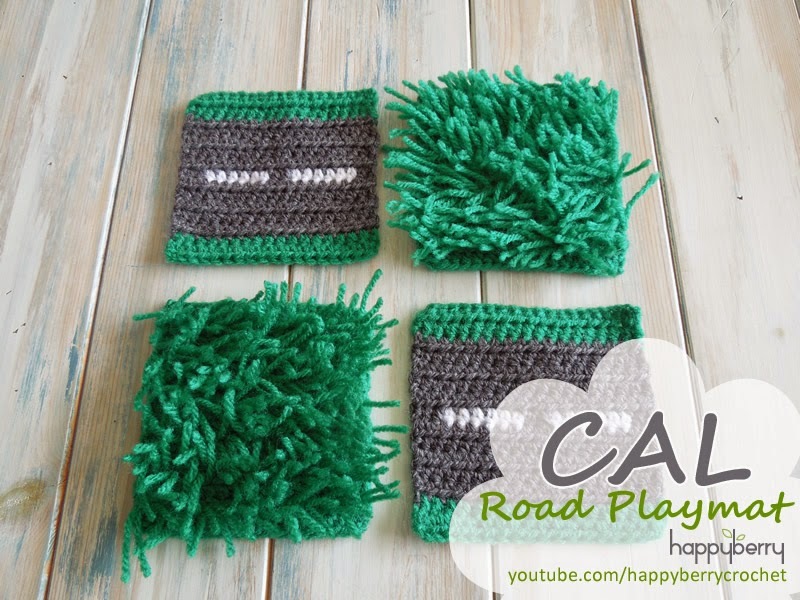 I may be stretching the 'yarn scrap' theme but hopefully you will enjoy joining me as I show you how to make an afghan, baby blanket or throw. I also show you how to make it bigger or smaller. 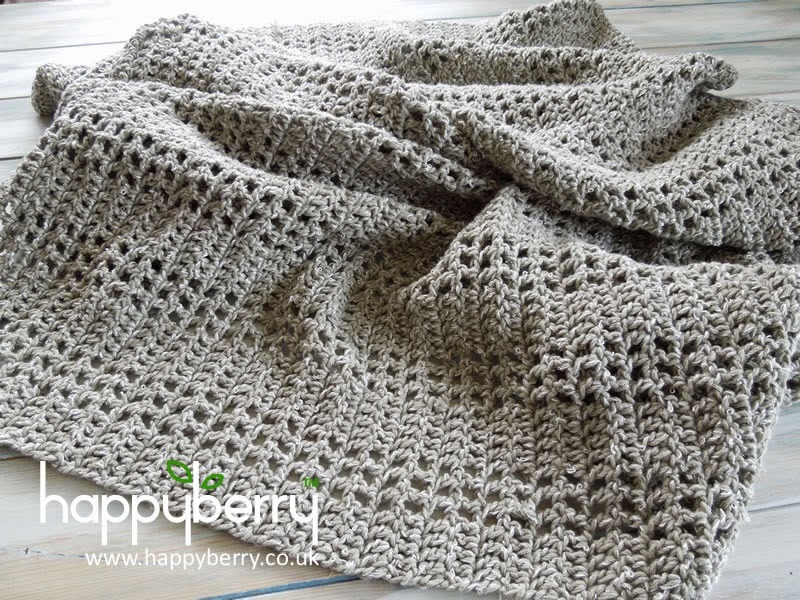 This pattern shows you how to crochet a small blanket, suitable for a cot bed or as an afghan or simple throw. You can watch my video tutorial here for this pattern too. Finished size if using same materials is 50 inches x 30 inches. For larger or smaller sizes work to odd units of 5 so 15, 25, 35 ... 85, 95 etc... This is so that the mesh pattern starts and finishes with closed blocks of double crochets. 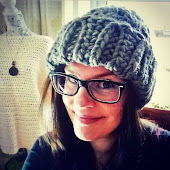 Click here to watch my video tutorial on how to do the double crochet foundation stitch. We are all familiar with the expression that a watched kettle never boils but every scientist will tell you that this is impossible (well unless it's broken or bought from Argos) as the laws of physics tell us that at some point the kettle will boil. What interests me is why it feels longer than if we went away and did an activity of some kind, which led me to muse over the idea of different forms of unspoken three minutes. So here is our first, the Washing Machine 3 Minutes, the last three minutes on the wash cycle as we sit staring at the washing machine impatiently waiting for our new item of clothing to be washed before we head out on the town. Dare I mention the never-ending last minute of a watched wash cycle, you know the one where we have to frustratingly wait for the washing machine to 'click' and graciously give us our clothes back. This is truly an anti laws of physics 3 minutes in my opinion. Then we have the London 3 Minutes, now this 3 minutes may be relevant to other city goers around the world too but especially to Londoners and ones who catch the Tube (underground train). In any normal station outside of London we would be joyful in finding out that the next train to our destination is just 3 minutes away, if anything we may even feel slightly rushed and panicked at catching the train before it leaves the platform but the underground 3 minutes? well that is a whole different story. After a night out all we really want to do is head home and relax our tired feet so we happily arrive at the underground platform, nice and empty and quiet, it is very late but then oh no! we see that the next train is a whole 3 minutes away from arriving. How on earth will we ever cope with such a long wait! 1 minute? great, 2 minutes? annoying but 3 minutes to the next tube arriving? well that is just forever! Then of course we have the Getting Up For Work 3 Minutes, ok this may be for the lazy ones of us out there but I am sure many of you are familar with the extra 3 minutes we can try and get away with before we have to get out of bed. Alarm goes off at a reasonable time, of course we never plan to actually get up at this time, oh no, we arrange in our heads that from the alarm going off we can achieve at least another 10-15 minutes in bed if we skip a few activities. However shortly after this decision has been made we either wake up to the snooze alarm going off or just in a general panic and here we reach the Getting Up For Work 3 Minutes, the 3 minutes we are convinced we can get away with on top of the extra 10-15 we've already had. The whole morning adventure of getting up can be a very finely tuned situation that any boss would be proud off if he could get past the fact we always seemed to arrive to work 3 minutes late. This 3 minutes is the one we convince ourselves we can have in bed if we just wash a bit quicker, skip a few things and just be as quick as we can to be out on our way at the very precise time of 7:04 or whatever bizarre exact time we seem to work to in the mornings. Oh yes that 3 minutes can be the longest ever in our heads. So of course we come back to our watched kettle that never boils, well posting this has distracted me enough that my kettle has finally boiled for my coffee, but I wonder how long it would have really taken if I just stared at it. You can also be safe in the knowledge that you have now wasted 3 minutes just reading my musings he he. It took me a few attempts to design this little rose but I'm pleased with the results in the end. The dusky pink yarn also gives a really nice coloured finish but of course you can use any yarn colours you like! For this little rose, which measures about 2" x 2" approximately including leaves, is perfect for using as an applique on hats or booties, maybe even make a few into a necklace or simple decorate your home with them. Fasten off and rolling up your rose petals into shape, they should naturally fold on themselves, use remaining yarn to fix your rose into position. Without fastening off repeat rows 1-3 for second leaf. 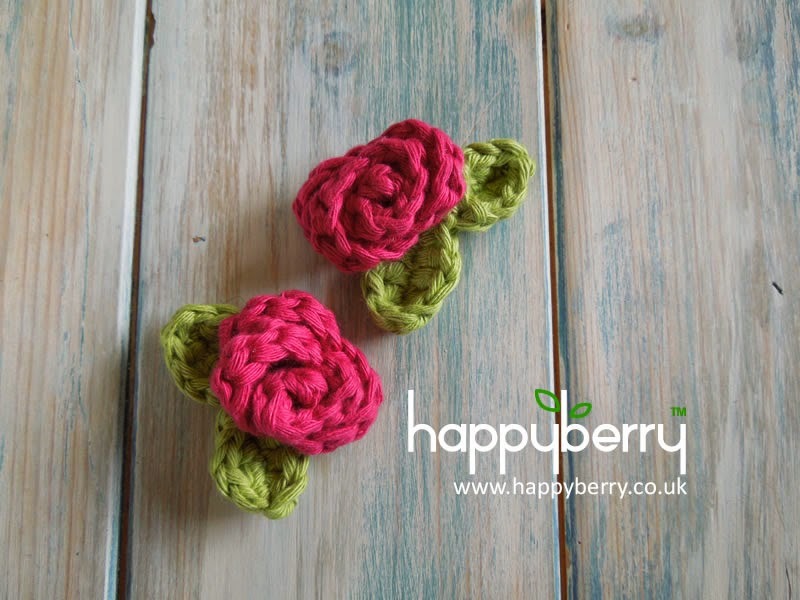 Fasten off and use remaining yarn to sew leaves onto the back of your rose.